Again I find myself so excited to write a review I just can’t wait to share! 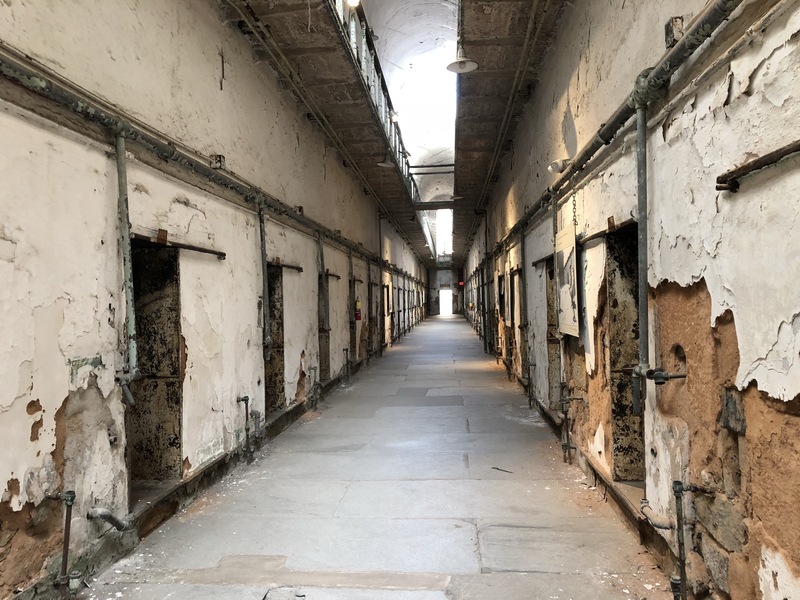 The Eastern State Penitentiary is such an incredibly fascinating heritage place. I’m going to start with a little bit of history then move into my experience of the site. There is so much I want to cover so I’m going to try my best to summarise as much as possible and hopefully persuade you to visit for yourself! 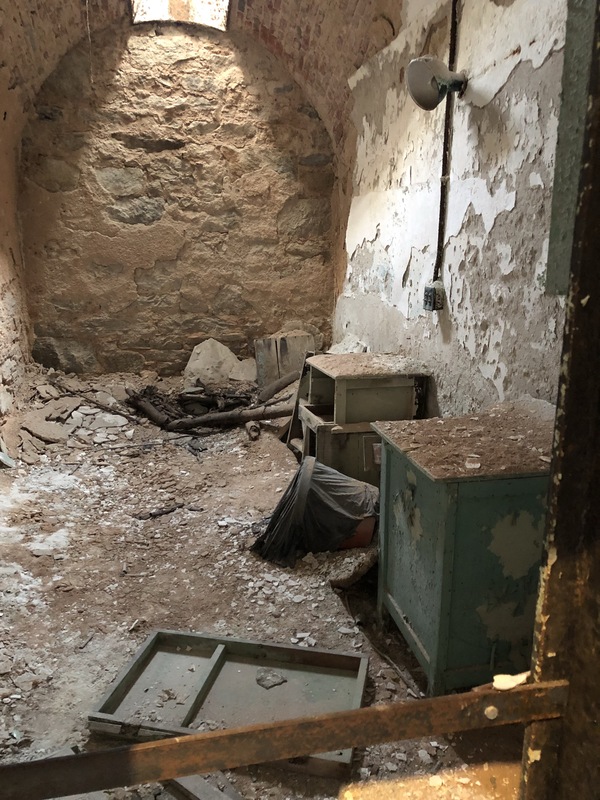 The Eastern State Penitentiary is regarded as one of the most famous prisons in the world. It was opened in 1829 and functioned as a prison until 1971. 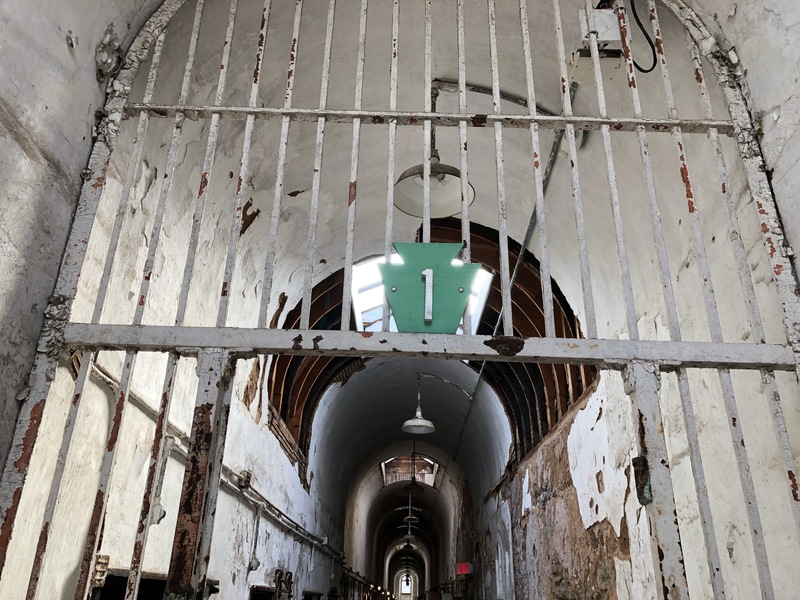 According to their website, this prison was the first true penitentiary, meaning a place designed to “inspire penitence”. 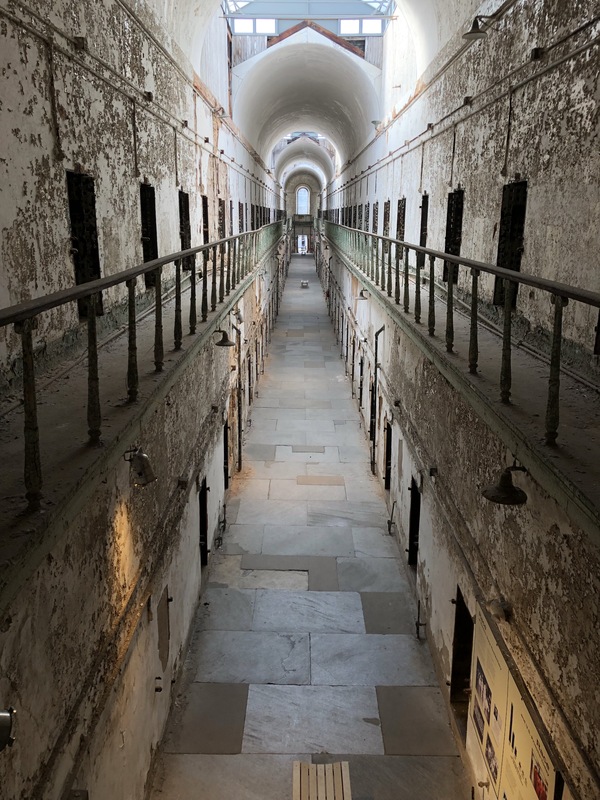 As opposed to other prisons at the time, namely Sing Sing in New York, the Penitentiary favoured solitary confinement over physical punishment. Bit by bit the prison closed and eventually was left to ruin. The decision had to be made with what to do with the site. Some wanted it completely demolished but others argued it should become a shopping mall. On the eve of the decision, a group of historians and preservationists fought to keep the site as a reminder of America’s past. Luckily, they won and now it is a site of stabilised ruin. I will write so much more on this concept later but let’s get into the site itself. The first thing you see when you arrive is a huge castle-like structure with two large gargoyles guarding the entrance. You literally feel intimidated from the word go. There were a couple of people waiting so they actually opened a little early so we could head inside. Included in your entry fee is an audio guide tour. It is narrated by Steve Buscemi so please trust me it is worth taking. Could not think of a more perfect person to guide you around. The entire audio guide tour only takes 45 minutes. 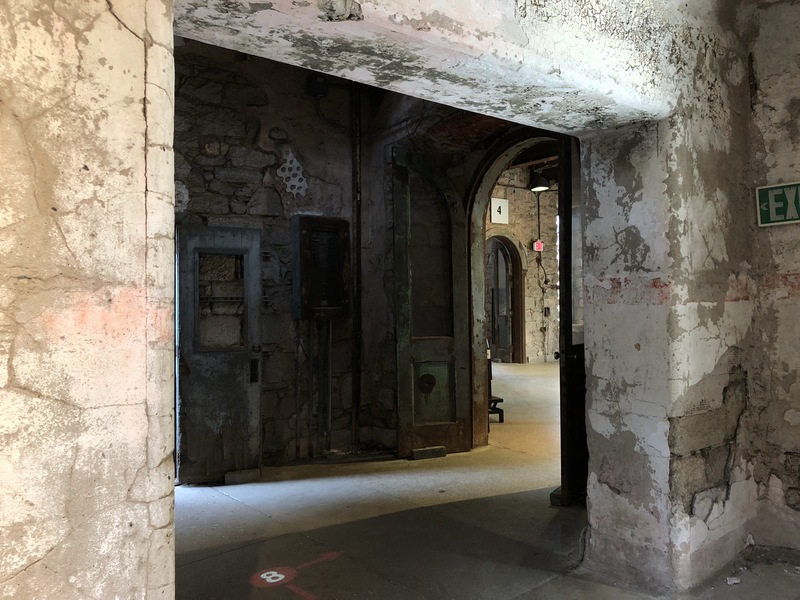 You are guided through one of the nine wings of cell blocks learning about the penitentiary’s history as well as life behind bars. 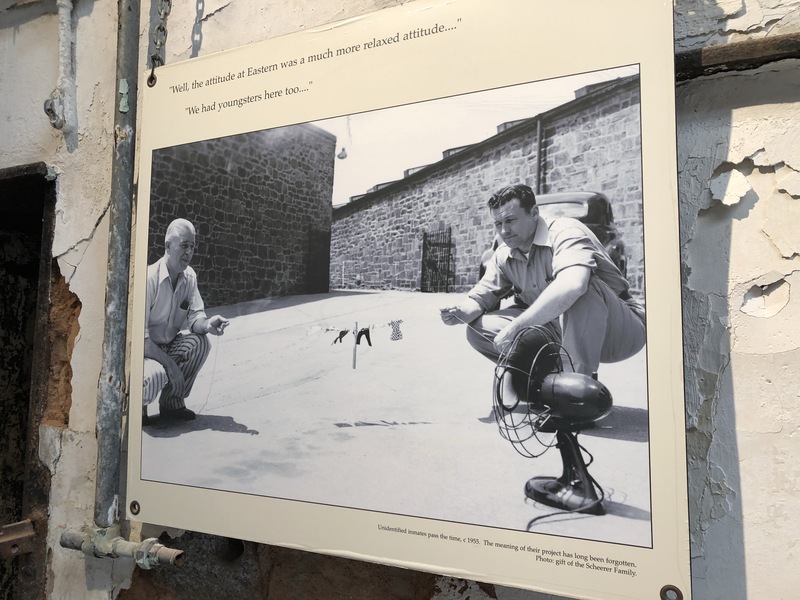 There are points on the tour when you hear from actual prisoners describing their individual experiences and sharing a story or two. Each stop was no more than 6 minutes so you’re not left standing around awkwardly in the way of everyone else. 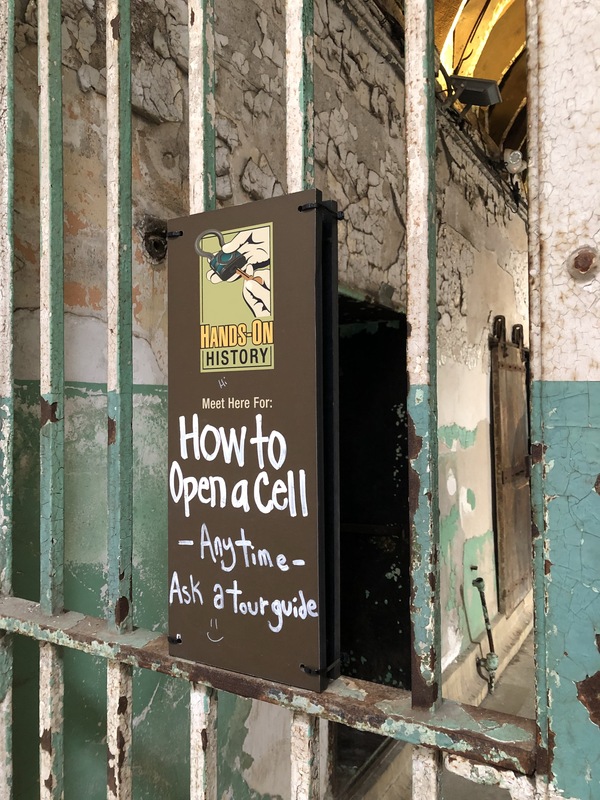 The tour makes a real effort to bring the prison into the modern day. Outside on the baseball diamond is a large sculpture which actually displays three graphs. 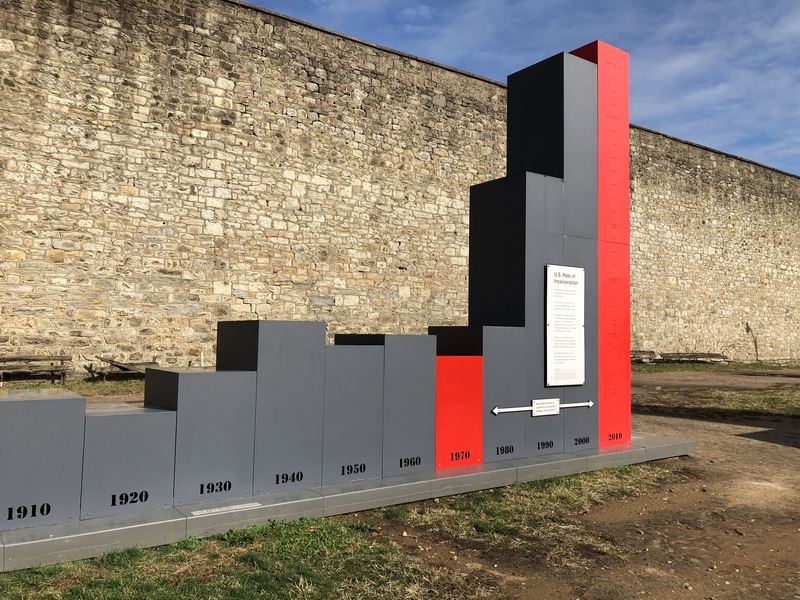 The first is the number of individuals incarcerated in America, the second compares this to the rest of the world, and the third breaks these figures down and looks at race. I know that America has a ridiculously high incarceration rate, but, seeing these numbers visualised was powerful. At the end of the tour you must say goodbye to Steve and go your own way. 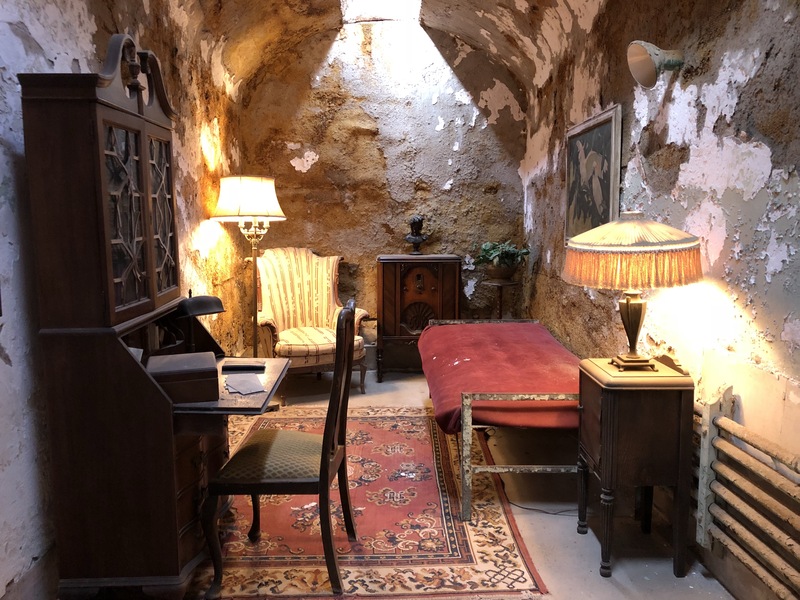 You can visit the cell of Al Capone, watch a short film on an escape tunnel archaeologists discovered, and even see contemporary art installations in a few of the other cells not visited on the tour. There are other exhibitions to see as well. We made our way straight to the cell of Al Capone. 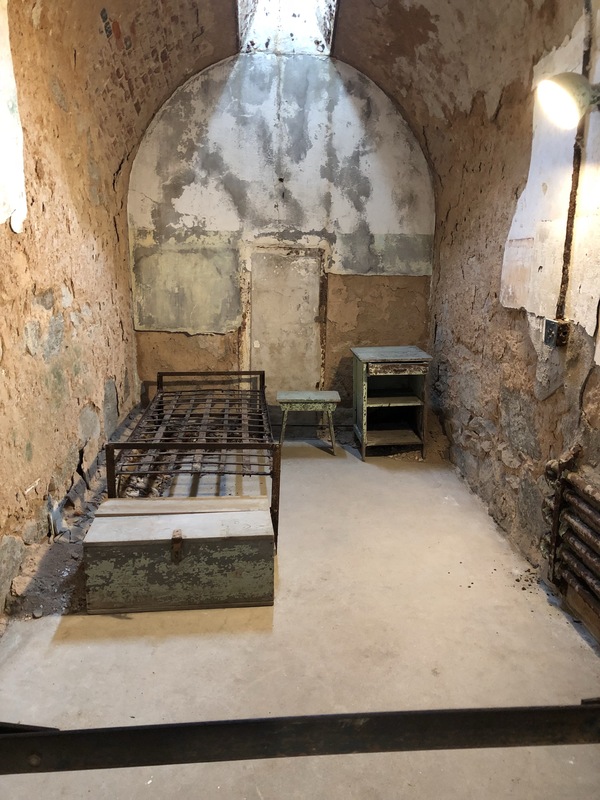 It is the only cell in the penitentiary that has been restored back to how it may have looked. As you can see, it is quite luxurious. Looks more like a New York penthouse than a prison cell. There was something so haunting about the place. 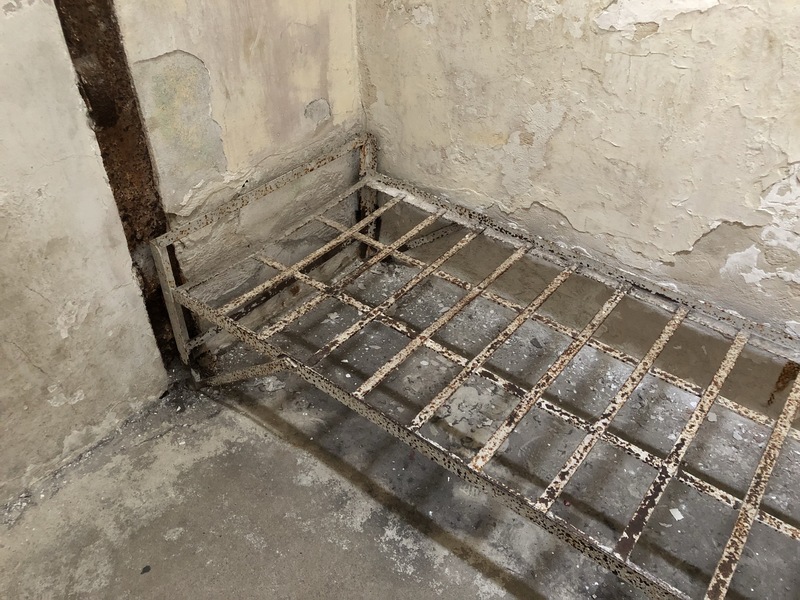 Paint was peeling off the walls, abandoned bed frames were discarded in the cells, and there was a feeling that you were walking through this site for the first time since it closed. I had one absolutely pressing question – what exactly was being done in terms of conservation? 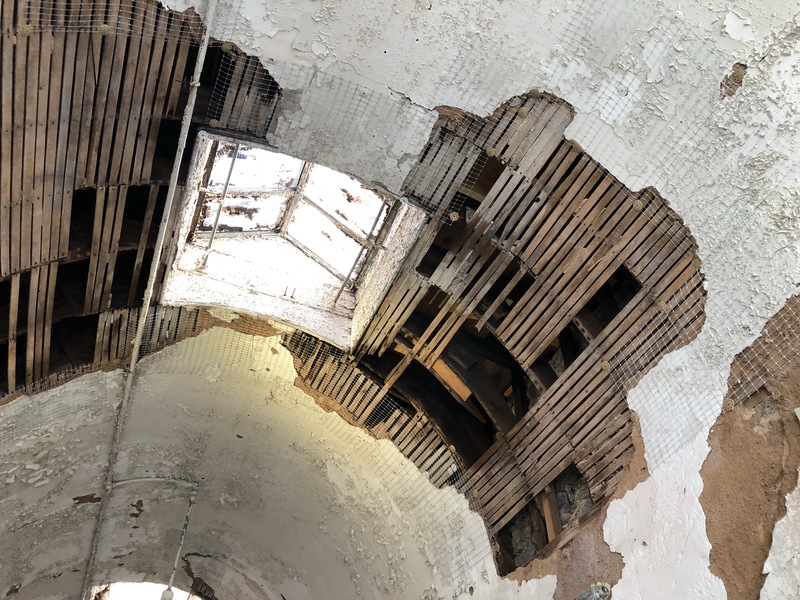 Was the penitentiary being left to ruin or were there conservation efforts going on? I found a member of staff who was super helpful in answering my question. He told us the site was regarded as a “stabilised ruin”. So what exactly does this mean. Rather than restore the cells or patch up the paintwork, the building was being preserved as best as it could in its current ruined state. He informed us that up until 2008 visitors were asked to wear hard hats, just in case. 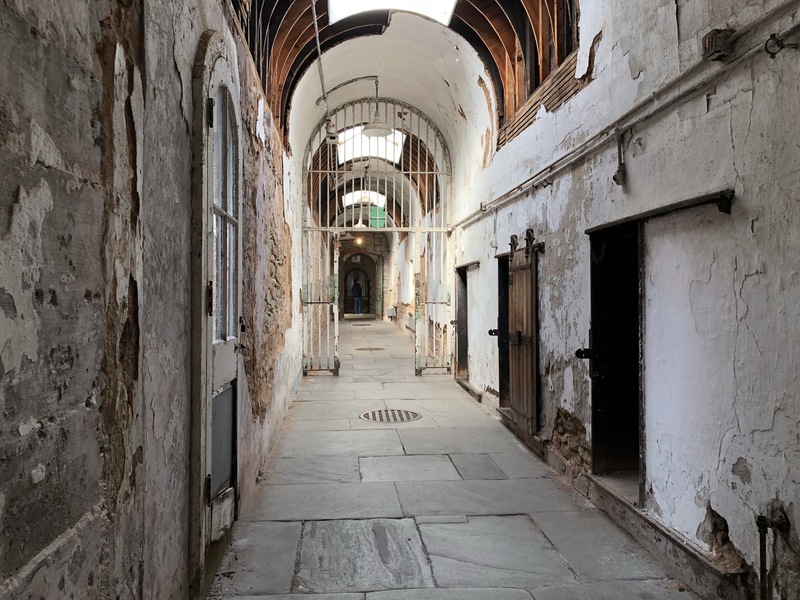 Now, more of the penitentiary is open to the public than ever before. More will eventually open over time as the ruins continues to be preserved. I’ve never really come across this idea. The best I could compare it to is Susannah Place Museum in Sydney. There is also an effort here to not interefere. With the Penitentiary, I’ve never seen a ruin this advanced being stabilised. In my opinion, I strongly believe heritage buildings should go one of two ways. Either be transformed into something useful that doesn’t interfere with its integrity or be preserved for educational/tourist purposes. The latter should always be achieved without compromising the building which I know is extremely hard to do. What I really loved about this place was that it is open to the public to be experienced exactly as it was left and not in a stylised form. Of course this approach would not work with every heritage building, but, here it has such a strong impact. 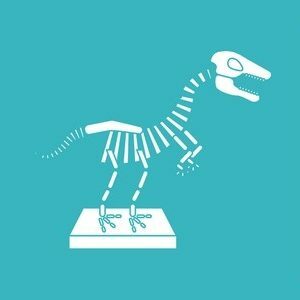 There is also a great sense that they want you to engage with the site as much as possible. There is the opportunity for hands on supervised interaction. A member of staff can help answer questions and actually allow you to experience the history that little bit more in depth. Speaking of interaction, there were so many ways you could have the site interpreted. 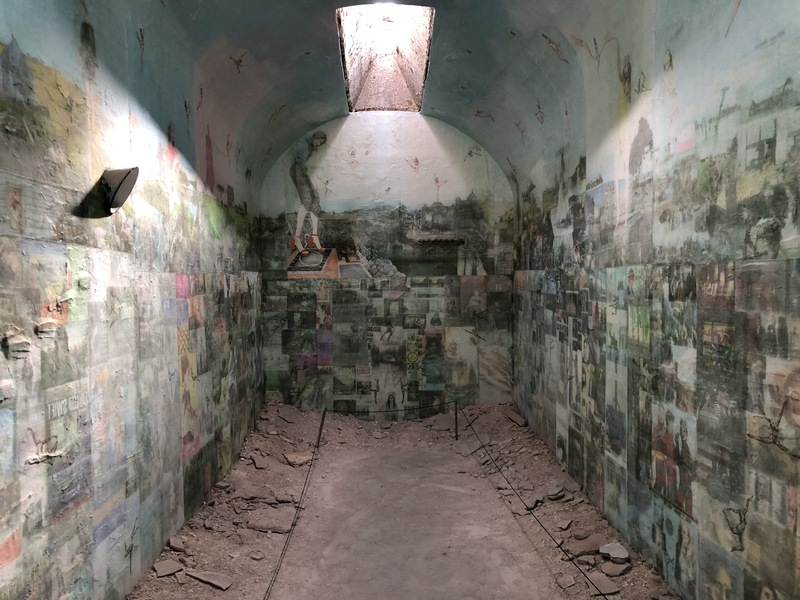 There is the audio guide, small exhibitions, guided tours, and photographs that appear on the cell block walls. This was my favourite showing prisoners drying little clothes. Why they’re doing this and who they are remains completely unknown. The final thing I want to discuss is some of the contemporary art dotted around the place. One installation was by Jesse Krimes, a former prisoner. While incarcerated, he transferred pages from the New York Times to his bed sheets using hair gel. The 39 panels were combined together when he was released to create a surreal landscape. I cannot recommend seeing this heritage place enough. It is both a place of pain and of beauty. 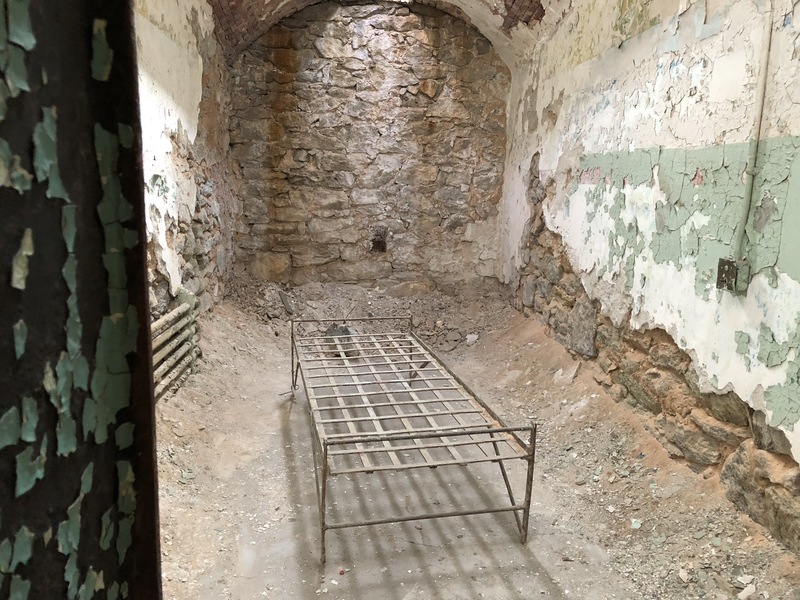 Hearing the words of the prisoners, you couldn’t help but imagine how hard life must have been in the penitentiary. Yet looking around now, there is an eerie beauty. That of a building with a past strong as the people who have walked through its doors. You really feel that the building was a living and breathing place getting stronger the more it turns to ruins.